Yesterday, the Government of Quebec bestowed its highest citation for accomplishments in cultural and scientific fields, the Prix du Québec, on two McGill researchers. Prof. John A. 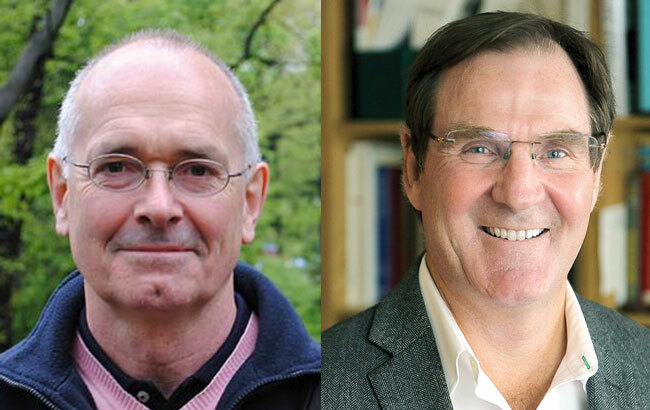 Hall received the Prix Léon-Gérin for human and social sciences, and Prof. Alan Evans received the Wilder-Penfield prize for biomedical research. Professors John A. Hall (left) and Alan Evans are the newest recipients of a prestigious Prix du Québec award. Yesterday, the Government of Quebec bestowed its highest citation for accomplishments in cultural and scientific fields, the Prix du Québec, on two McGill researchers. Prof. John A. Hall of the Department of Sociology, Faculty of Arts received the Prix Léon-Gérin for human and social sciences, and Prof. Alan Evans received the Wilder-Penfield prize for biomedical research. A total of 14 Prix du Québec laureates were named this year. The Prix have been awarded every year since 1977. Prof. Alan Evans is James McGill Professor of Neurology, Psychiatry and Biomedical Engineering at McGill, and a principal investigator and former head of The Montreal Neurological Institute’s McConnell Brain Imaging Centre (BIC), where Canada’s first PET scans, MR images and CT scans were produced. After earning his PhD in biophysics at the University of Leeds (UK), he worked for five years at Atomic Energy of Canada before joining The Neuro in 1984. Prof. Evans studies functional neuroanatomy by using three-dimensional computer techniques linked to advanced brain imaging scans (PET and MRI). His work in collaboration with cognitive neuroscientists has led to the creation of important brain structural models and large-scale brain databases. Since 2008 he has directed the CBRAIN program, a research platform for neuroinformatics that has formed the basis for the Big Brain project, a highly detailed open-access brain imaging database that provides imaging details down to the cellular level. He is also the Scientific Director of the newly launched Healthy Brains for Healthy Lives program, funded by a seven-year, $84 million award from the Canada First Research Excellence Fund. Healthy Brains for Healthy Lives is a cross-disciplinary initiative to advance the understanding of the human brain with the goal of making long-term improvements in clinical outcomes of the treatment of brain diseases and disorders. Prof. John A. Hall the James McGill Professor of Comparative Historical Sociology. His work in sociology deals with state-building and nation-building, with an emphasis on European history. His recent research looks into the ways in which Ireland, Denmark and Switzerland – all three small, relatively homogenous nation-states – managed the 2008 financial crisis. A book on the topic, The Paradox of Vulnerability, is currently in press. He is the author of over thirty books and has authored or co-authored over sixty book chapters and scholarly articles in the field of political sociology. Prof. Hall’s citation for the Prix du Quebec states that his interdisciplinary work in sociology and history sets him apart as one of the finest observers of contemporary political realities. Earlier this year, Prof. Hall was honoured by the Royal Society of Canada with the Innis-Gérin Medal for his distinguished and sustained contribution to the literature of the social sciences. The purpose of the Prix du Quebec is to recognize the career of women and men who have demonstrated a passion for their calling. Winners are individuals who have stood out for their creative or innovative spirit and whose work has contributed to the influence of Quebec around the world and to the evolution of Québec society in their respective fields.